‘Naan ready – Neenga Readiya ?” – was the poser to audience by Sarathkumar….. not many years ago ! Do you remember the show “Koteeswaran” featuring the actor in Sun TV on the lines of ‘Kaun Banega Crorepathi’ ? Koteeswaran is common name – a Hindu name after Lord Easwar; one denoting unlimited riches. ‘koti’ is crore and the one named so is blessed to possess crores of values… way back in 1955 there was a Sivaji Ganesan / Padmini starrer produced by Sri Ganesh Movietone with background score by G Ramanathan. This is nothing about the Cinema – about the mind sport or more about a person from Bihar turning riches in the game. Koteeswaran was a much hyped game show, a regional Quiz on the lines of KBC – remember was sponsored by Hindustan Lever… in those days the advt rates for KBC were stated to be around Rs 3.5 lakh for 10 seconds. Koteeswaran never succeeded the way KBC did – the poor tamil viewers were thus denied opportunity of becoming richer unlike their counterparts from cow belt. There was another attempt - `Koteeswari', initially intended to be a game show, a precursor of jackpot, hosted by Kushbu. The prize money was a lowly lakh of rupees. Perhaps South Indians can never win in KBC – there would always a Q on Hindi tinseldom, a sitter for most Indians and certain doom for people like us. Then the one in mythology or local adaptation also would be a killer.. The 5th season of game show "Kaun Banega Crorepati" is on and now Sushil Kumar from Bihar has won the mega prize of Rs.5 crore. The present episodes show the participant’s background, their homes, their locality often portraying their simplicity. Sushil Kumar, is a computer operator and tutor who earns Rs.6,000 per month. For those uninformed, Kaun Banega Crorepati is an Indian reality/game show based on the UK game show Who Wants to Be a Millionaire? – the 5th version which is now aired offers a maximum cash prize of Rs.5 crores (Rs.5,00,00,000/-) The show first aired in 2000 and was hosted by Amitabh Bachchan. This was the first appearance of Bachchan on Indian television. On 5 August 2005, the show was restarted after a four-year hiatus with prize money enhanced to 2 crores. It abruptly ended in 2006 with Amitabh falling ill. Star Television roped in Shahrukh Khan to host the third season of the show but was not a real success. So the 4th season, it was Amitabh at the hot seat again (rather infront of the hotseat which was reserved for the select participants) calling computer jee, lock kiya jaye !! – but the prize money was decreased to 1 crore with a jackpot Q for 5 crore. It was an instantaneous hit. It perhaps was a better version of the hindi blockbuster - Slumdog Millionaire. The winner who got married recently was reported as stating that he never thought in his wildest dreams that he would do this ! "This is what the common man is all about. 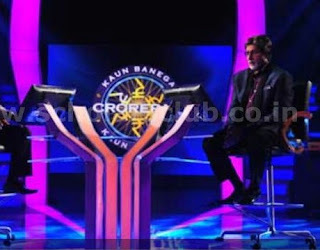 This is what KBC is all about - given an opportunity, the common man has the strength the ability and the accumen to prove to the world that he is the best and second to none," stated the 69-year-old Bachchan, who hosts KBC. Questions would look simple and answers too easily known when you see and judge it from outside… that is more because your failures are not counted and your answers are not valued… attach some value of gain or a loss to your decision then most men would fumble often on very ordinary Qs, answers to which most people would claim to know. That way, there should have been pulsating excitement on the set and the expectations on air at the venue for the crew and spectators should have been unimaginable. It is the highest prize money ever in the history of Indian television. Tension would grip the viewer as each question would be answered and perhaps sometimes you start praying for the participant to know the right answer !! The reports state that Sushil took more than long time in deciding on going for the last Q after crossing the 1 crore mark. The defensive mindset would have forced ordinary mortals to walk away with the crore prize money; he eventually decided to go for it and after he answered and results were known, the entire place just exploded. The family of Sushil Kumar, the contestant, not prone to any kind of public jubilation ran on to the floor of the set in uncontrollable joy and screams and tears of happiness, whilst the live audience were whooping it up on their feet with the loudest scream. The episode, featuring Sushil Kumar's win, will be telecast Nov 2, 2011. In the first season Harshvardhan Nawathe from Mumbai won 1 crore; in 2004 Rahat Taslim from Jharkand won Rs.1 crore but quit before the jackpot question for Rs.5 crore. Phone a Friend:- contestant can ask a friend – to be answered in 30 seconds, where often friends fumble to answer within the given time. Ask an Expert: - provides the contestant to ask an expert via live face-to-face audio and video connection. Double Dip: - allowing the contestant to make 2 guesses at a Q. In the first episode there were the famous 50/50 which will remove 2 wrong answers off the 4 and Flip the Question by which the contestant can avoid the Q and take another Q from the Computer. Now we're going to do is raise up, tap onto that shin and come right back down whooty song to parallel.